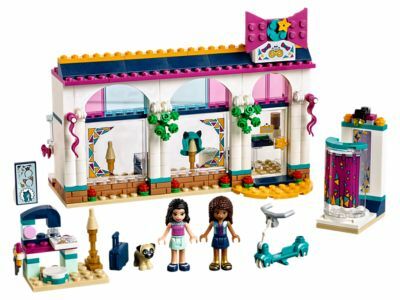 Find a new look at LEGO® Friends 41344 Andrea’s Accessories Store. Head to the fitting room and help Andrea try on a new wig or skirt, then choose a bow or bag to go with it for her next performance. Spin the dressing room around so that Emma can give her advice and make alterations with her sewing machine. Dexter the dog wants to give his verdict too—he approves! Treat him with a cookie before Andrea scoots off to her next rehearsal. Price is 39% below the initial Lego retail price, a € 13.74 discount! This comes down to 7.23 cent per brick. The Andrea's Accessories Store (41344) Lego set is available from the sites below. However, they do not offer delivery to your selected region. The Andrea's Accessories Store (41344) Lego set is no longer directly available from the sites below. However, 3rd party partners of these sites might still have the set available. Alternate description Try out all the latest fashions at Andrea’s Accessories Store.